…waking up in the morning to the sun glistening off your own private alpine lake. After breakfast in the expansive kitchen and great room, you put on your bathing suit and go out to the sandy beach for a swim across to the exposed granite and ancient Native American petroglyphs on the other side. Later, you grab a fishing pole to try for some large-mouth bass or recline in a patio chair and soak in the serenity. After lunch, you head up to the tennis court for some basketball, then relax in the wide hammock beside the lake. You grill dinner out on the deck, and as the sun turns distant Signal Peak orange and red, you finish with s’mores cooked to perfection in the outdoor fireplace. 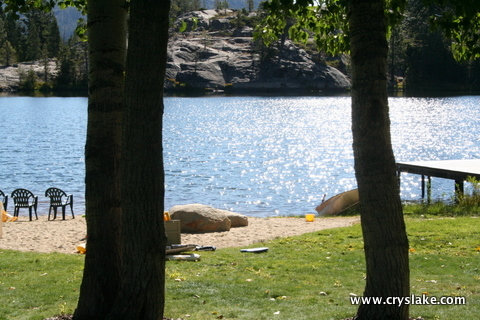 Idyllic…and the experience can be yours, at Crystal Lake. 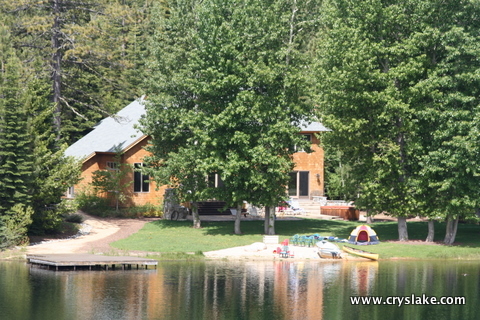 Crystal Lake is a 210 acre mountain estate featuring a 6-bedroom lodge with hot tub and tennis court on the shores of a completely private alpine lake. The estate is surrounded by the Tahoe National Forest, allowing unlimited hiking, mountain biking, and exploration. There are no other houses on the lake, it is for your personal enjoyment. The house has 6 bedrooms, 5 with bath attached, 3 common areas and a large kitchen with a massive entertaining island. The great room leads out onto the deck with a fireplace and it is about 50 yards to the beach and the dock on the lake. There is also a tennis court with adjustable basketball hoop, a play structure with swings and a slide, and a hot tub. The lake is deep, crystal clear, and perfect for swimming and fishing. Jump off the dock, or float near the beach. Only 2 miles from Highway 80 in the Sierra Nevada mountains, the estate is less than 3 hours from the San Francisco Bay Area, or fly in to Reno or Sacremento for a shorter drive. Perfect for weddings, family reunions, or just a weekend getaway, the Crystal Lake estate is now available for limited rental.